St. Sebastian Dabovich: Do not think that a man is a real scholar of the Bible because he can quote by memory ever so many passages . . . This entry was posted in Sayings from Saints, Elders, and Fathers, St. Sebastian Dabovich and tagged Delusion, Holy Scriptures, Psalm 90, Questioning Bishops/Priests/Clergy, Reading the Scriptures, Spiritual Reading, Temptation of Christ, The Evil One, The Fall on July 3, 2015 by . St. John of Kronstadt: . . . Christ taught us truth; the Devil teaches us falsehood, and strives in every way to contradict every truth . . . It would seem, after this, that even when living upon earth we must live as if in the heavenly kingdom, dwelling there in anticipation by hope. But in reality, for the greater part, the contrary is the case. Men cling with their whole being to the earth and everything earthly. Wherefore is this? Because our common enemy, the Devil, endeavours with all his might to oppose the intentions of the God-man, Christ. He endeavours to do everything in opposition to what Christ did and does. Christ wishes to raise men up to heaven, and has given them all the means to attain this; whilst the Devil, who himself for his pride was cast down from heaven into the dominions of the air, wishes by every means to attach men to earthly,- sensual, transitory things, and, in order to attain this end, he employs the most powerful, most prodigious means. Christ taught us truth; the Devil teaches us falsehood, and strives in every way to contradict every truth; devising various calumnies against it. The Devil endeavours by every means to keep men in error, in the enticement of the passions, in darkness of mind and heart; in pride, avarice, covetousness, envy, hatred, wicked impatience and irritation; in evil despondence, in the abominations of fornication, adultery, theft, false-witness, blasphemy, negligence, slothfulness, and sluggishness. This entry was posted in Sayings from Saints, Elders, and Fathers, St. John of Kronstadt and tagged Adultery, Blasphemy, Covet, Darkening the Mind/Nous, Delusion, Demons, Despair, Envy, Fornication, Greed/Avarice, Hatred, Hope, Kingdom of Heaven, Lies, Material World, Mind, Overcoming Sin/Passions, Passions, Pride, Sloth, Spiritual Warfare, The Evil One, Theosis, Truth, Virtue, Worldliness on July 23, 2014 by . Whenever a person even slightly illumined reads the Scriptures or sings psalms he finds in them matter for contemplation and theology, one text supporting another. But he whose intellect is still unenlightened thinks that the Holy Scriptures are contradictory. Yet there is no contradiction in the Holy Scriptures: God forbid that there should be. For some texts are confirmed by others, while some were written with reference to a particular time of a particular person. Thus every word of Scripture is beyond reproach. The appearance of contradiction is due to our ignorance. We ought not to find fault with the Scriptures, but to the limit of our capacity we should attend to them as they are, and not as we would like them to be, after the manner of the Greeks and Jews. for the Greeks and Jews refused to admit that they did not understand, but out of conceit and self-satisfaction they found fault with the Scriptures and with the natural order of things, and interpreted them as they saw fit and not according to the will of God. As a result they were led into delusion and gave themselves over to every kind of evil. The person who searches for the meaning of the Scriptures will not put forward his own opinion, bad or good; but, as St. Basil the Great and St. John Chrysostom have said, he will take as his teacher, not the learning of this world, but Holy Scripture itself. Then if his heart is pure and God puts something unpremeditated into it, he will accept it, providing he can find confirmation for it in the Scriptures, as St. Antony the Great says. 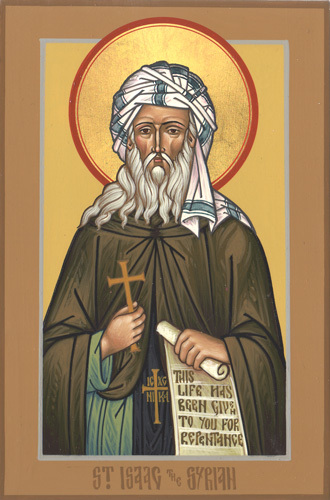 For St. Isaac says that the thoughts that enter spontaneously and without premeditation into the intellects of those pursuing a life of stillness are to be accepted; but that to investigate and then to draw one’s own conclusions is an act of self-will and results in material knowledge. This is especially the case if a person does not approach the Scriptures through the door of humility but, as St. John Chrysostom says, climbs up some other way, like a thief (cf. John 10:1), and forces them to accord with his allegorizing. For no one is more foolish than he who forces the meaning of the Scriptures or finds fault with them so as to demonstrate his own knowledge — or, rather, his own ignorance. What kind of knowledge can result from adapting the meaning of the Scriptures to suit one’s own likes and from daring to alter their words? The true sage is he who regards the text as authoritative and discovers, through the wisdom of the Spirit, the hidden mysteries to which the divine Scriptures bear witness. The three great luminaries, St. Basil the Great, St. Gregory the Theologian and St. John Chrysostom, are outstanding examples of this: they base themselves either on the particular text they are considering or on some other passage of Scripture. Thus no one can contradict them, for they do not adduce external support for what they say, so that it might be claimed that it was merely their own opinion, but refer directly to the text under discussion or to some other scriptural passage that sheds light on it. And in this they are right; for what they understand and expound comes from the Holy Spirit, of whose inspiration they have been found worthy. No one, therefore, should do or mentally assent to anything if its integrity is in doubt and cannot be attested from Scripture. For what is the point of rejecting something who integrity Scripture clearly attests as being in accordance with God’s will, in order to do something else, whether good or not? Only passion could provoke such behaviour. This entry was posted in Sayings from Saints, Elders, and Fathers, St. Peter of Damascus and tagged Allegory, Delusion, Holy Scriptures, Humility, Intellect, Quotes from the Philokalia, Reading the Scriptures, Scr, St. Anthony the Great, St. Basil the Great, St. Gregory the Theologian, St. Isaac the Syrian, St. John Chrysostom on August 5, 2013 by . 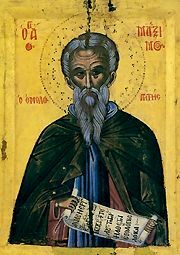 St. Peter of Damascus: Whenever a person even slightly illumined reads the Scripture . . . This entry was posted in Sayings from Saints, Elders, and Fathers, St. Peter of Damascus and tagged Allegory, Delusion, God's Will, Greek, Holy Scriptures, Holy Spirit, Ignorance, Jews, Knowledge, Opinion, Passions, Reading the Scriptures, St. Anthony the Great, St. Basil the Great, St. Gregory the Theologian, St. Isaac the Syrian, St. John Chrysostom, Wisdom on July 19, 2013 by .